Is the ball "in" or "out"? Jojoba Hills has several used paddles available for members and visitors to use. When you are ready to purchase your own paddle you can check out Choosing a Paddle. It is good to know How to Hold It and to begin to become acquainted with the Basic Rules. Don't feel overwhelmed as we will also cover the rules as we go. 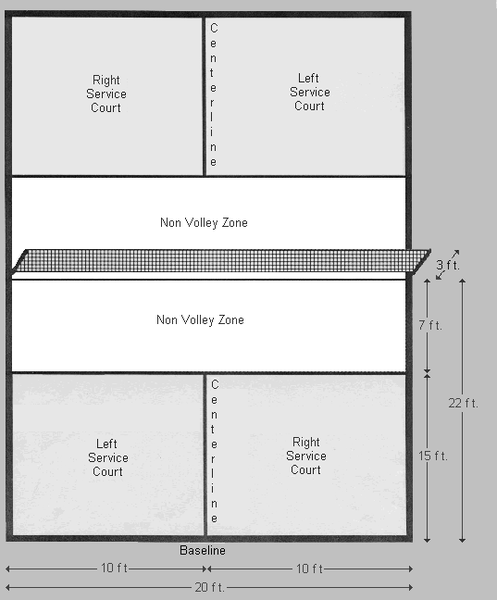 A Pickleball court is similar to a Badminton Court. 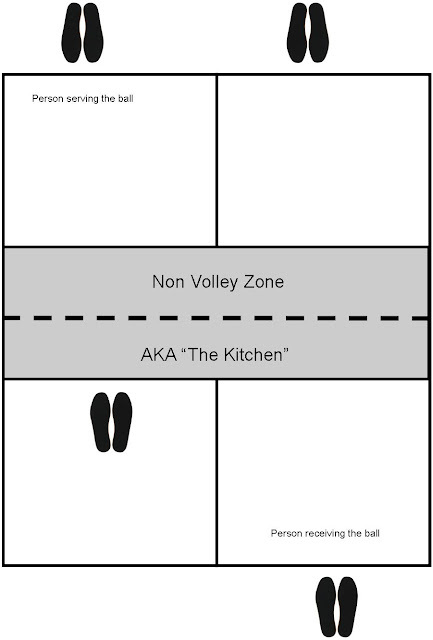 Something unique to Pickleball is the “Non Volley Zone”, more commonly known as the “Kitchen”. Players are not allowed to step into the Kitchen (which includes the line) and hit the ball on a volley (hitting it without letting it bounce first). However, if it first bounces in the Kitchen then a player MAY step in to hit the ball. It is worth remembering is that while the net is 36 inches high at the posts it is only 34 inches high in the center. Before you actually start playing it is also good to understand how to tell if a ball that hits a line is “in” or “out”. 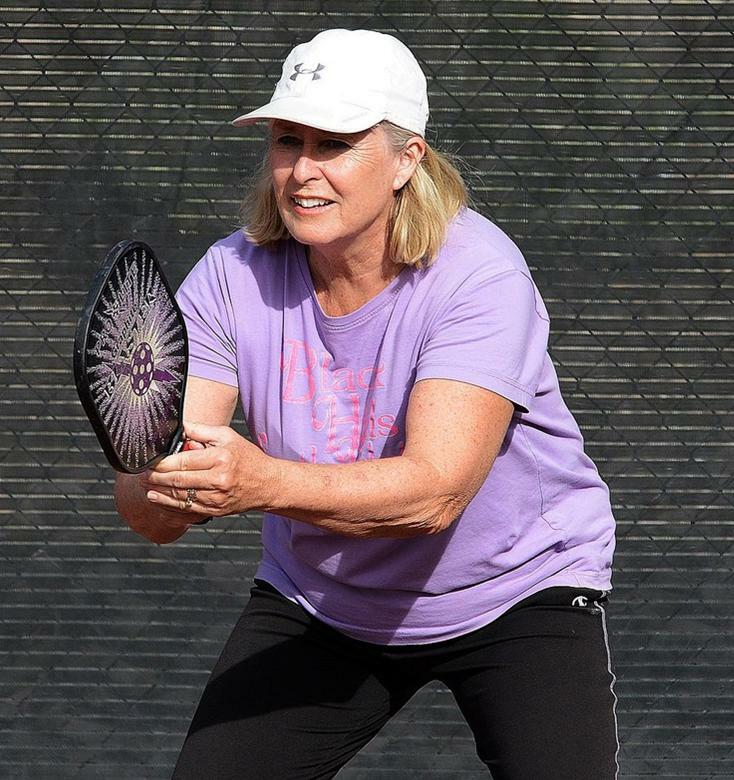 Pickleballs are made of hard plastic that doesn’t compress on contact like a tennis ball does. Therefore the contact area is small, about the size of a dime. So even if part of the ball looks like it is over the line that small area of the ball may not actually be touching the line. If so then that ball is out. This short video illustrates the point well. So whose responsibility is it to call the ball "in" or "out"? Even though players on the opposite court may think they can tell if the ball is "in" or "out" the fact is that they have a poorer view, especially of the baseline, so they don't get to call it. It is the responsibility of the players who are receiving the ball and one or both team members may call it "in" or "out". An important rule to remember is if there is a dispute and one player calls it "in" and their partner calls it "out" then it goes to their opponents as it is considered to be "in". So it is probably a good idea in close calls to quietly confer with your partner before announcing your verdict to your opponents. Another thing you need to know before you start is where to stand. Both players of the serving team stand behind the base line. The player who will receive the serve (the one diagonally opposite the server) should also stand behind the base line so they are prepared to receive a deep serve. However, the other player on the receiving team (the one standing opposite the server) should stand with their feet just a few inches from the Kitchen line. The reason for this will be explained in "Starting a Game". With the exception of the server all players should assume a “ready position”. 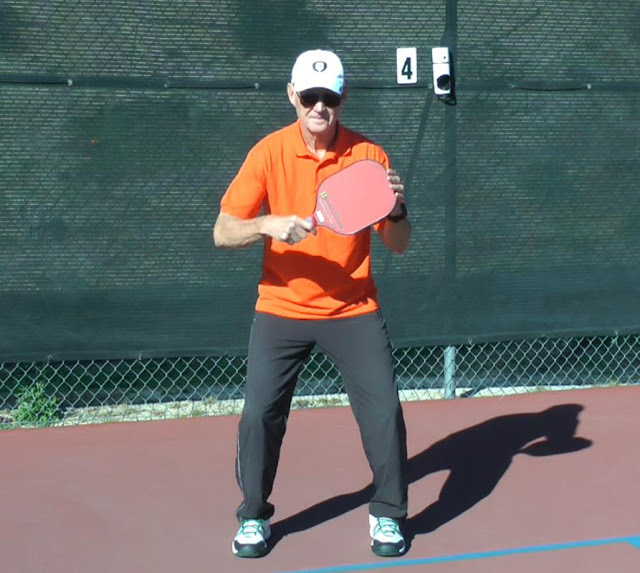 Prem Carnot, AKA “The Pickleball Guru”, describes this as standing with your knees bent, your chest up but leaning slightly forward on your toes and holding your paddle up chest high. He’s says you can hold the paddle perpendicular to your body or with the back of the paddle facing forward. It is considered a good idea to lightly touch the paddle with the fingers of your opposite hand. The helps ensure that your paddle is properly aligned, perpendicular to the ground. This position helps you to be ready for the majority of shots. 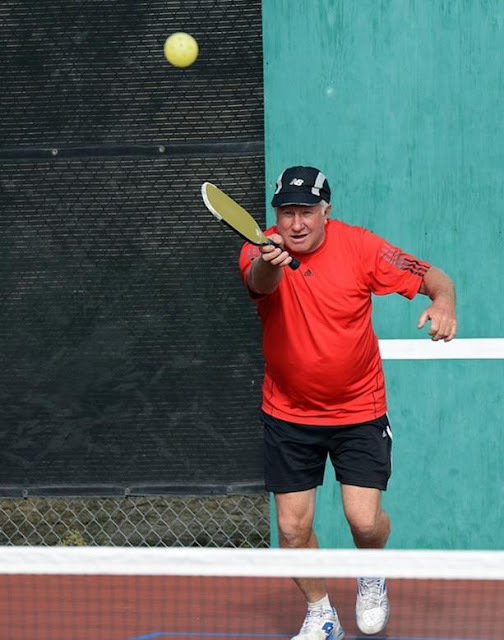 Some players, especially former tennis players, prefer to put both hands on the handle. However, one argument against this starting position is you aren't truly ready for either a forehand or backhand. It is also necessary to know about the order of serving. In doubles Pickleball both team members get an opportunity to serve before it is their opponent’s turn to serve. The only exception is at the very beginning of the game when only one of the players on the serving team gets to serve. This is to counteract the advantage that the team serving first has over the other team. The first serve of a game is always done from the right hand court. If the serving team wins the rally and scores a point they keep the ball and the server switches sides with their team mate. This will be repeated if the serving team scores another point. 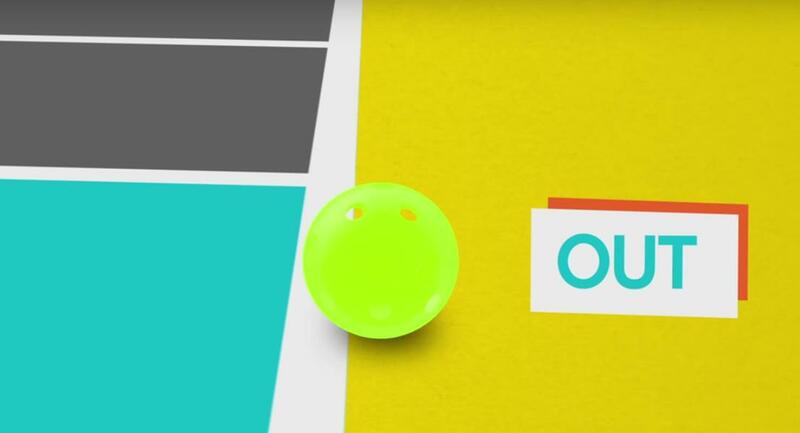 If the serving team loses the rally (they hit the ball out of bounds or into the net) their opponents get the ball and the player in the right hand court on their side is the first to serve. From this point forward both players on both teams will have the opportunity to serve. Now about keeping score. Games are played to 11 points but games must be won by two points. Only the serving team can score points. Players must announce the score just prior to serving the ball. This is done by announcing three numbers; their team's score, their opponent's score and which server they are (first or second). So if your team has two points, your opponents have three points and you are the first server then you would say "two, three, one". Something that can be confusing occurs at the beginning of the game when only one person on the serving side gets to serve the ball. As neither team has any points the score is "zero, zero". The way this first server indicates that their partner will not be serving after them is to indicate they are the second server. So they should announce the score at the beginning of the game as "zero, zero, two". Okay, now that you have some basic understanding of the game you can move on to "Starting a Game".